CAMARILLO, Calif., March 20, 2019 — Semtech Corporation (Nasdaq: SMTC), a leading supplier of high performance analog and mixed signal semiconductors and advanced algorithms, announced that Germany-based PureLink GmbH, a global manufacturer and distributor of Professional AV equipment, has combined Semtech’s BlueRiver™ Software Defined Video over Ethernet (SDVoE™) technology with its new IPAV Pro Series products. The IPAV Pro Series is equipped to handle all conceivable AV applications as an extender, switcher, splitter, matrix, or video wall controller. By combining IP-based input and output points (Tx/Rx), the solution is able to mimic functionality of traditional AV distribution products with a level of flexibility previously unavailable. 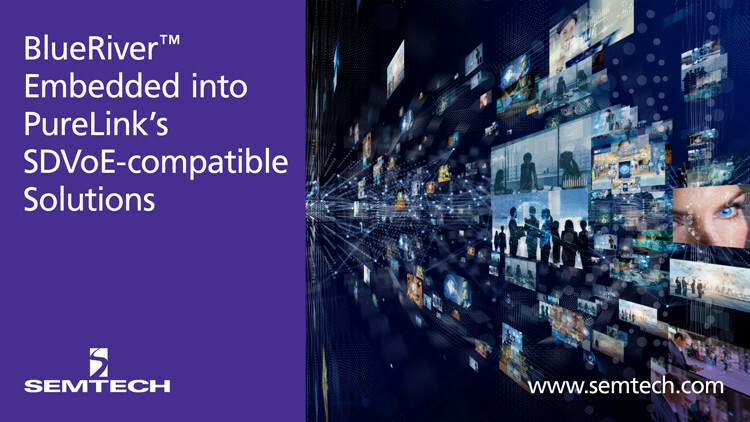 Semtech’s BlueRiver platform enables switching and extension of audio, video and control signals over standard Ethernet networks. Purelink’s new IPAV Pro Series combines the revolutionary 10GbE IP switching technology with a rugged and resilient aluminum chassis, designed specifically for the rental and staging industry. PureLink GmbH develops, produces and markets products for professional presentation and media technology. Since 2006, PureLink has been one of the international branch leaders for digital connectivity solutions. As manufacturer and distributor, PureLink partners with wholesalers, mail order companies, industry, planners and installers. The product portfolio comprises consumer equipment, as well as individual customer solutions. Professional products from leading international manufacturers complete the wide range of own-brand products.